My contribution to this event is a Lemon Cheese Danish Pie...that's right a danish pie. I took the best part of the danish; the filling and the cheese and put it into a pie crust. 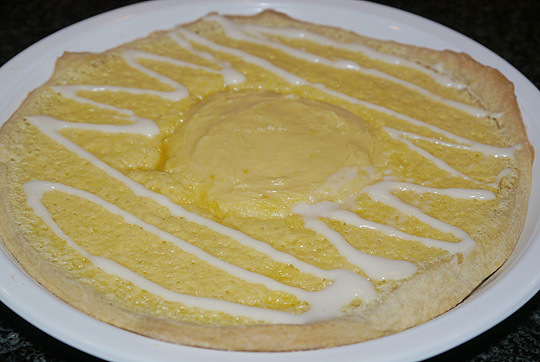 The result is a nice tart lemon flavor mellowed out by the sweetened cream cheese center. In a bowl beat the eggs until thick. Add in the rest of the ingredients and continue beating until combined. Preheat oven 325. Roll out the dough into your pie pan. Place all of the cream cheese filing in the center; making a nice circular shape. Pour in the lemon filling around the cream cheese. Place in oven and bake for 30 mins or until the lemon filling is set. Love tour lemon pie for #PiDay! Looks delicious! You had me at lemon! Looks tasty. Yum....lemon + danish = hook a sister up!! Oh sweet HESUS...My problem with this amazing pie-danish...danish-pie, is that my dad and I would fight over it. So, to win the game, I'd slap some chocolate ice cream on a piece so I would be sure to get some. YUM! I have been craving lemon everything and this looks so fantastic! Diet? what diet? this looks SO temptingly delicious.